Best Electric Skateboards Explained – TOP 10 reviews, tech specs, ratings and comparisons. You are about to discover the Best Electric Skateboards of 2018. Whether you are a sports enthusiast or using it as a last mile vehicle you will love the array of new models that hit the market in 2018. Brands improved their performance with better charging options, powerful motors, sealable batteries and remote controls. Also from the design point of view you can find from classic models to most new age, from simple bamboo finishing to artistic prints decks. Electric Skateboards are becoming accessible to everybody, any age, any occupation, any taste. Check it for yourself! Should you get an electric skateboard? Of course you should! And here’s why. You’ve probably ridden them all: hoverboards, e-bikes, skates, skateboards, longboards vintage mini-decks. You’re definitely still a fan of one or some (or all! ), but if you’re looking for a different kind of rush, then electric skateboards can give that thrill you seek. Why get an electric skateboard? An e-skateboard allows you to focus on the ride. You do not have to waste extra effort with your back foot to gain momentum. You gain the freedom to ride while developing the ambidextrous skill that differentiates the regular skater from the pro. Best of all, it’s fun and can be the practical choice for that last mile ride. Here’s our take on the best electric skateboards in the market today. A good electric skateboard implies performance-level material and parts. It should be durable, lightweight, well-powered and easy to control. We’ve scoured the market for the best electric skateboards and we’ve trimmed our long list down to 10. Here are our picks for the TOP 10 Best Electric Skateboards. This model is light enough to carry anywhere and yet powerful enough to get you climbing 25% hill grades. It weighs just 15 lbs. The travel friendly standard (default) battery gets you across 6 miles, while the extended battery (sold separately) guarantees a distance range of 12 miles. Maximum speeds reached on the Boosted 2nd Generation Dual is 22 mph. The Elevens 38” is powered by a conservative 400W brushless dual hub motor but the drive system on this model magnifies the torque thrice! Maximum speed is around 25 mph. The thrust reached is equivalent to 4 times the power that elite Tour de France riders generate when climbing a mountain! The Inboard M1 Premium is known for its regenerative braking and smooth deceleration. You are in control at all times. 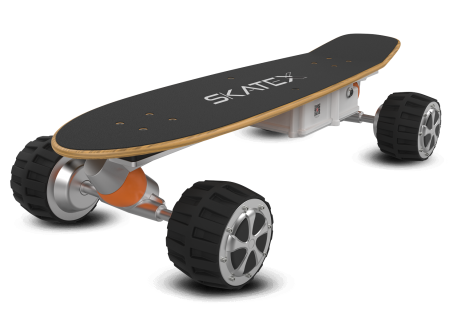 The remote control that comes with it offers 4 riding modes, making this model a great e-skateboard for the novice. The stiff deck provides good stability at higher speeds. At just 8 lbs, the Genesis G5 is the flyweight in the Genesis lineup. This model boasts a top speed of 12 mph and a maximum range of 6 miles. Most customer reviews report more than 6 miles. The reasonably-priced G5 is also a top pick for last-mile transport devices. If you still find yourself having to walk a considerable distance to your destination after a bus, train or car ride, consider this skateboard for its mileage and durability. We love the BLITZART Tornado 38” for its maple wood bamboo deck. This 8 layer deck consists of 6-ply maple wood sandwiched between a layer of bamboo on the top and bottom of the board. This lends flexibility to the board while maintaining its sturdy structure. The concave deck is outfitted with grip tape that keeps the rider’s feet firmly in place. This model comes with an easy to hold, ergonomic wireless remote. The BLITZART Mini Flash 28” is a great electric skateboard for novice and pros alike. It showcases a classic deck shape and can run at a maximum speed of 12 mph. Like the BLITZART Tornado 38″, this model features a maple wood and bamboo deck that give the structure more flexibility and sturdiness. It also comes with an ergonomic wireless remote. The Action Blink Lite is a good starter electric skateboard for kids and teens who weigh up to 130 lbs. It’s a model built for fun with its signature safety LED lights, wireless remote control, smart app and Bluetooth connectivity. Maximum speed reached is 10 mph while distance range is 5 miles. The built-in LED lights make the young rider visible to traffic and pedestrians both in daylight and night time. This model weighs just 7.7 lbs and is easy to carry around. The Swagtron Swagboard features a gorgeous deck made of bamboo and Canadian Maple. The spacious deck allows you to position your feet wider, giving you that added confidence that comes from better balance and stability. It can run at speeds of up to 15 mph and cover a distance of 15 miles on a single charge. Two of its most loved features are its wireless remote and long-lasting battery. But the best part? The Swagboard can carry loads of up to 330 lbs! At just 11 lbs, the Atom Electric B.10 is a power-packed skateboard that can climb hills in excess of 10%. It features a 1000W motor and has the smoothest acceleration and braking system thanks to its foc sine-wave controller. Customers love this model for its versatile kick-tail and convenient carry handle built into the tip of the deck. At just 12 lbs, this portable electric longboard can take you as far as 7 miles on a single charge. Beginners and pros alike will love this model for its 500W motor. Features include built-in LED lights, remote control, back and forward riding modes, as well as its Canadian maple deck. Polyurethane wheels ensure strong grip and smooth rides. The shuttle, bus, train or car can take you from point A to point B. But the 25-minute brisk walk from point B to your final destination should be spent grabbing those extra minutes of sleep. What if you could zoom past that short distance? An e-skateboard is a great last-mile vehicle. It is fast becoming a legitimate form of urban transportation because of its compact size, power and wow factor on the curb. Here are our TOP 3 picks for the best Commuter Skateboards on the market today. The BLITZART Huracane 38” can get you to the office in style thanks to its sturdy maple wood and bamboo deck. It has a maximum speed of 15 mph and has a range of over 17 miles on a single charge. The ergonomic wireless remote gives you complete control over acceleration and deceleration. This model comes with reverse capabilities and provides a smooth, stable ride compared to models of the same size and capacity. With a top speed of 16 mph and a maximum range of over 10 miles, the X-Plore 38” showcases a great, well-designed deck made of bamboo and 8-ply maple wood. Customers love this model for its streamlined, futuristic deck design. It also comes with an ergonomic wireless remote and only takes 2.5 hours to charge. With the capability to climb 25% hill grades and maximum speed of 22 mph, the Boosted 2nd generation Dual+ Electric Skateboard is a power-packed last-mile vehicle. It is light enough to carry anywhere and yet powerful enough to go everywhere, even uphill! This model comes with a Bluetooth-enabled remote and two battery options (standard battery – 6 mile range or extended battery – 12 mile range). A well-designed electric skateboard must merge art and function. You want a powerful and sturdy skateboard. You want something that provides both thrill and safety. But you also want a ride that’s a cut above the rest. Less is, indeed, more! This model features a 100% Japanese T700 carbon fiber deck, a 3000W dual motor and a fire safe battery system. It is sleek, simple, minimalist in design and boasts a speed range of up to 22 mph. This lightweight e-skateboard (14 lbs) can easily cruise uphill (25% grade). The Airwheel M3’s all-terrain rubber tires are its winning streak. With its sturdy deck and built-in damper masses, you get stability and stronger anti-skid capabilities. Customer reviews report that this model rides like a surfboard! We love the MotoTex MT-SKT for its 1600W motor (800W per motor, dual motors) and signature oversized wheels. The dual motors (one on each rear wheel) allows the board to turn but prevents it from twisting during acceleration. The wheels provide more traction on dirt. The three-speed system is controlled via wireless handheld remote. You’re excited, thrilled and ready to take on the world! But we know that as a novice rider, you also want a model that allows you to balance easily. You want a stable ride and yet you want something that provides the thrill you seek. The Inboard M1 is famous for its regenerative braking and smooth deceleration – two features that novice riders would appreciate. The 4 riding modes on this model help you gain balance and confidence in no time. The BLITZART Mini Flash 28” is a great electric skateboard for novice and pros alike. It has a classic deck shape and can run at a maximum speed of 12 mph. This model features a maple wood and bamboo deck that give the structure more flexibility and sturdiness. It also comes with an ergonomic wireless remote. Beginners will love this model for the stability it provides. 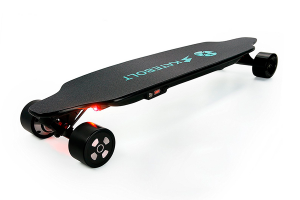 The Action Blink Lite is a great electric skateboard for kids and teens who weigh up to 130 lbs. It’s a model built for fun with its signature safety LED lights, wireless remote control, smart app and Bluetooth connectivity. Built-in LED lights make the rider visible to traffic and pedestrians even in the daytime. Maximum speed reached is 10 mph while distance range is 5 miles. When it comes to electric skateboards for teens, design and power always take top priority. Not all electric skateboards are created equal, of course. We’ve run through lists of customer reviews and found that it all boils down to great design and function. Here are our TOP 3 Electric Skateboard Models for Teens. The Swagtron Swagboard stands out from the rest because of its gorgeous bamboo and Canadian Maple deck. The spacious deck also allows teen riders to position their feet wider and gives them that added confidence that comes from better balance and stability. It can run at speeds of up to 15 mph and cover a distance of 15 miles on a single charge. 15 miles on a single charge, three riding modes and 4 layers of bamboo + fiberglass material on its deck … what more could a skateboarding teen ask for? The lightweight Buffalo F provides great stability and durability. It also features water-proof, dust-proof and shock-absorbing wheels. The Skatebolt loves to disguise itself as an ordinary manual skateboard. It has a simple design and doesn’t call too much attention. But once it cruises down the street at 25 mph or climbs hills of up to 30% grade, it becomes the star of the show. It has 2 speed modes and a switch that allows forward and backward cruising. 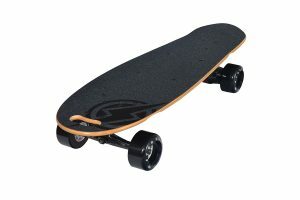 Electric longboard skateboards are, as what the name implies, the electric version of the typical longboard skateboard. As opposed to the ordinary skateboard, electric boards allow you to travel faster, speed up or down hills, and even brake gently. There’s actually more to them than just that, and that’s what we’re going to discuss below. 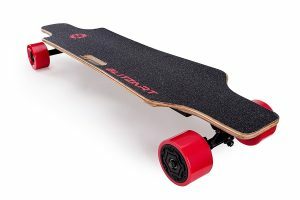 An electric skateboard is an electric-powered board that’s made up of four components aside from the skateboard itself. They are the battery, motor, remote control, and an electronic system. 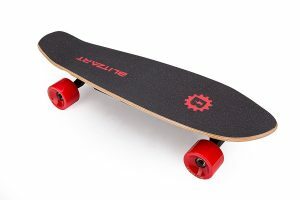 They work the same as your usual skateboard with the exception that electric longboard skateboards are a lot easier to maneuver and can also go faster. Obviously, electric longboard skateboards are designed for the avid skateboarder who wants a fun and innovative means of skateboarding. This, however, doesn’t necessarily mean that they are only limited to that certain group. They are also intended for those who want to give skateboarding a go but don’t want to experience the hassles and possible injuries that a typical skateboarding activity brings. With a motor that helps run the board, boarders are given the freedom of choice on how to use it. Since it is remote controlled, it only means that you can adjust it based on your own preferences. Electric street skateboards are designed for smooth and hard surfaces like concrete and tarmac. This type of skateboard allows you to ride on your urban landscape without any hassle. Usually, it comes with a fully functional motorized system, an integrated software, and a remote control which allows you to configure the speed, power, and range based on your personal preferences. A common setup for an electric street board comes in 15 pounds and under. 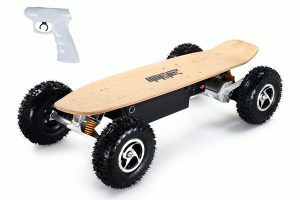 The all-terrain system is something that even purists would admit is something that’s entirely possible with electric longboard skateboards. Typically, an all-terrain system comes with four driving modes which are slow, eco, fast, and GT. It’s capable of traveling through gravel roads, sandy beach paths, steep hills, and even grass fields. Possibly the riskiest type, and the one I wouldn’t recommend you except if you’re an expert at electronics, an electric DIY skateboard is exactly what it says it is. DIY sites come with their own tutorial on how to make a do-it-yourself board by taking a normal skateboard then attaching a motor and a bit of an electronic system. While it’s possible to make a DIY electric board, a lot of things could possibly go wrong. There’s even the risk of fire or electrocution, especially when exposed to heat or rain. A hybrid DIY skateboard is one that uses patented technology and incorporates a bit of tinkering to make a fully functional and somehow safe electric board. It can be done by affixing a protected motorized drive system into your skateboard and converting it into an electric version with a little handy work. Since electric longboard skateboards contain electronics, you might be at risk of electrocution when you exposed them to water or rain. As such, you need to make sure that your e-skateboard comes with a waterproof feature. Also, the internal components will quickly deteriorate if they get exposed to water. Also, most electric skateboards use belt and pulley drivetrains. If they get exposed to water or wet surfaces, they could get clogged with dirt which, in turn, reduces the amount of torque. This can also shorten the life expectancy of your skateboard’s internal parts. There’s nothing worse than riding on your electric board only to find out that it doesn’t have enough battery juice to keep it running for a few minutes more. When it comes to batteries, bigger ones are almost always better. After all, bigger batteries are capable of storing more power, thus allowing you to ride even farther in just a single charge. However, not all batteries for electric longboard skateboards are made of premium quality materials. A rule of thumb is to choose a battery that can provide at least an hour of riding and at least 20 miles of coverage. Additionally, if you’re heavy, you’ll end up creating more load on the drivetrain. As such, you should get a board with a large battery – somewhere around 300Wh or more will do. You should know the type of motor setup on so you can have an idea what to expect from a board. Basically, electric skateboards are categorized into two based on the motor setup: hub motor and belt driven. A hub motor is placed inside of the wheel, while a belt driven have the motor placed outside of the wheel. Generally speaking, hub motors are a lot cleaner to look at and are less prone to breakdowns. Meanwhile, belt driven motors are typically larger, thus allowing them to generate more power. The only caveat is that they are more prone to breakdowns. The best electric skateboards on the market feature PU (polyurethane) wheels since they provide a better grip plus an extra durability. There are also some which are made of pneumatic rubber. Regardless of the wheel type, you just have to make sure that the wheels are durable enough, or else they will wear down quickly. Most people tend to overlook the speed of electric skateboards. It’s often the first attribute people look for when shopping for an e-skateboard. Though some are capable of reaching up to 30 mph or even more, most boards can only hit max speed after they’re fully charged. On average, electric longboard skateboards can go around 25 mph, but certain factors such as your weight, height, wind resistance, battery, and more can affect their speed. On average, some of the best electric skateboards can reach up to 20 miles in one charge. However, most manufacturers of electric longboard skateboards now allow you to upgrade to a more advanced 12 Ah LiFePO4 battery pack. As a result, your board will weigh 10kg less since the LiFePO4 only weighs 5kg as compared to the 15kg weight that SLA standard packs have. Electric skateboards should be safe as long as you don’t tinker with the electronics inside. Also, you need to make sure that you wear proper gears and avoid hitting max speed while riding. Lastly, since they consist of electronics inside, you should make sure not to run them through wet surfaces or exposed them to rains. An electric skateboard is an amazing innovation which allows skateboarding enthusiasts to enjoy their skateboarding activities in a more advanced manner. Even if you are a purist, riding on one of these electric people-movers will surely offer you a new and exciting experience.